For those who are not exactly sure where they are at any given time, check out the band "Brighton, MA" based in Chicago, IL. But the Cambridge Water Department, which oversees the park, wants to ban nonresident pooches from roaming off leash and plans to outfit Cambridge canines with bright red medallions, so the rangers who patrol the park can see which dogs belong and which do not. Cambridge already officially allows off-leash dogs in Fresh Pond Park, but the Water Department feels that there are so many running around now and pooping that the water supply is getting contaminated. Boston hasn't officially allowed "Dog Recreation Spaces" (the official term) until a City Ordinance (11.10-2) passed by the Council two years ago provided the mechanism for neighborhood groups to apply for, construct, and maintain them. Complaints in March about faded crosswalks in Brighton on Washington Street between Covenant House and Whole Foods Market have led to their repainting last week. The best news? The City's painters did both crosswalks -- including the one that was so completely gone that it could easily have been missed. On a related note: the Boston Globe ran a story Monday on the City's slow efforts to re-paint crosswalks. [Dennis] Royer [the city's public works and transportation chief] wants to rethink the paint patterns in the city's crosswalks so that they hold up better under heavy traffic; he also wants to create a computerized system to track when crosswalks are due for restoration. Still, he acknowledged, those solutions are months, and in some cases years, away. How about a spreadsheet with location in one column, date most recently painted in another column, and priority (e.g., near a school) in a third column? You could be fancy and include the daily traffic volume for that street from the BTD's traffic database. The spreadsheet could be filled out daily as crosswalks are repainted... and then, a couple of years from now, for example, just sort on date and... voila! You've got an ordered list of those needing repainting sooner rather than later. But maybe this method is too cheap. I'm sure the City would require sending out a contract to be bid. Maybe I'll propose a quarter million for my solution. Proceeds from this sale will allow the Archdiocese to invest resources for the benefit of our parishes, clergy, St. John’s Seminary and the many important programs that serve a large number of people. Several of those items were made very clear in the unprecendented release of the Archdiocesan financial records in the past year, but it is hard to avoid pointing out an apparent omission from Cardinal O'Malley's list: financing the settlements with the victims of sexual abuse by Archdiocesan priests. The Rev. John A. Farren, rector of St. John's Seminary since 2003, had been scheduled to step down on June 30 to take a new assignment in New York City, but Farren resigned last week after the school's board voted to support the sale of 18 acres of archdiocesan land to Boston College. Farren e-mailed a letter of resignation to the board on May 24 that detailed his fierce opposition to the sale, which includes the seminary's Bishop Peterson Hall as well as the seminary library. Brighton Center: Beginning of the End? The Redstar Perspective blogs on how Brighton Center -- in particular the Brighton Main Streets district -- appears to be going downhill in a hurry. I'll leave it up to the reader whether or not they agree with the blogger's opinions (such as intense hatred for Smokey Joe's BBQ). Usually, the Allston-Brighton TAB's police blotter listings of drug activity consist of people caught with "personal" quantities of a single drug, more often than not caught in the Allston Village neighborhood. Former Boston College linebacker Raymond Henderson, 23, was arrested on May 17 at his apartment at 29 Sutherland Road after a warrant search turned up a sizeable quantity of drugs. Police reportedly recovered approximately 28 grams of cocaine, several bags of marijuana and hallucinogenic mushrooms, a large electronic scale, and $3,612 in cash. Henderson was arraigned Friday morning in Brighton, charged with trafficking in cocaine and possession of class C and D substances with intent to distribute, and held on $5,000 cash bail. He’s due back in court on June 19 for a probable cause hearing. Post a comment with your own version of a title for this post -- mine is certainly not the best one around. The Boston Bulletin ran a story last week about the community meetings of the Boston College Neighbors Forum, focusing on the issues of undergraduate dormitories and athletic facilities. While Pahre said the [BC Neighbors Forum] supported artificial turf for the athletic fields, they opposed the idea for the stadium field due to issues with flooding, drainage and pollution. Actually, the group didn't directly address the general question of the use of artificial turf for any athletic fields, but certainly did not support "artificial turf for the athletic fields" within the Brighton Campus. What the attendees did support was continued informal use (e.g., intramural) by Boston College of the fields in their current state (i.e., with natural turf). State of the Allston-Brighton Neighborhood: "Turmoil"
The Allston Brighton Community Development Corporation held its annual meeting (for 2006), which was a public event titled, "The State of the Neighborhood." When the U.S. President gives his State of the Union speech, there is usually a line like: "Today I report to you that the State of the Union is strong." The final adjective is typically a positive one, but may vary from year-to-year. Outgoing Allston-Brighton District City Councilor Jerry McDermott addressed the attendees at the ABCDC event by offering a less rosy adjective for the State of the Allston-Brighton Neighborhood: "turmoil." He immediately added a positive spin, however, by saying that, for the A-B community, "when the chips are down, they are at their best." "The universities did something they didn't intend to," McDermott continued, "they got strangers [in the community] talking to each other. Some of the powers-that-be are a little nervous about that." There was criticism from both the audience and the speakers about the problems faced by institutional expansion in Allston-Brighton. At-Large City Councilor Felix Arroyo called for structural changes at the City level: "We need a planning department. We are the only city in the country that doesn't have a planning department... The people should have a say in planning." Arroyo is working on passing an ordinance to create such a department, and claims a total of five of the thirteen councilors are already on-board. He advised the crowd as to the importance of city planning and institutional development: "You are about to have an election. I think that is a key question about who you are going to vote for City Councilor. Councilor Arroyo: "Planning needs to be brought to the people"
Residents and officials decried what they have said is a development process lacking in transparency and community collaboration. Many were sharply critical of the Boston Redevelopment Authority and its blanket control over development, and calls for a separate planning office were frequent. “Planning needs to be brought to the people,” said [City Councilor Felix] Arroyo, who is co-sponsoring legislation in City Council to establish a city planning department independent of the BRA. The end of the ABCDC's annual meeting provided the opportunity for a mini-debate among four of the nine candidates for the open Allston-Brighton District City Council seat. I didn't get a chance to attend... but it sounds like it was a little bit of pleasant theater. Norwegian Bike Lift: Coming soon to Parsons Street? 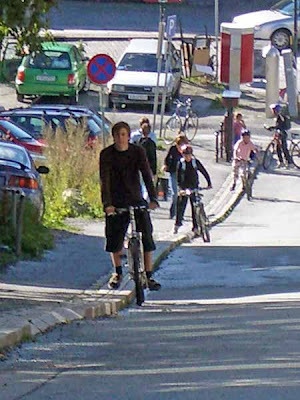 Newton Streets and Sidewalks blog reports on a Norwegian technological device to assist bicyclists getting up a steep street: a bike lift. When you come to a steep hill -- a 20% grade, in this case in Trondheim, Norway -- you push the button, set one foot on the device, and a metal plate pushes your foot up the hill while you continue to sit on your bike. Easier to see in action than describe, so watch it on youtube, of course. I'm a bicycle commuter between Brighton Center and North Cambridge (except when there's snow around or it's pouring rain). On my nightly return, I bike up the steep hill at Parsons Street south of Arlington Street. Why not install one there? This Trondheim bicycle lift is undoubtedly a great idea: a mechanical device to help a two-wheeled transportation appliance go uphill. I wonder if anybody has ever patented such a clever machine? Oh, yeah, they did back in 1884: the motorcycle. It was a good idea at the time... maybe someone could revive it. The Boston Globe reported today that the Archdiocese of Boston will sell all but one building, "St. John’s Seminary," to Boston College for $65 million. I'm guessing again that the news story refers to the Archdiocese keeping "St. John's Hall" while selling "Bishop Peterson Hall." They expect to complete the sale by August 1, 2007, but the Archdiocese offices would not be moved completely to Braintree until July 2008. The Boston Globe and the Boston Herald have both published editorials today which offer support for the Archdiocese's possible (or probable) move of it administrative offices from the Brighton Chancery to Braintree. Mayor Menino is unhappy with the idea of a move, but the Herald says that the Mayor "picked the wrong fight here." The Globe's piece put the issue into a wider context of the institutional expansion that Boston College is pursuing onto the former Archdiocese property now being referred to as BC's Brighton Campus. 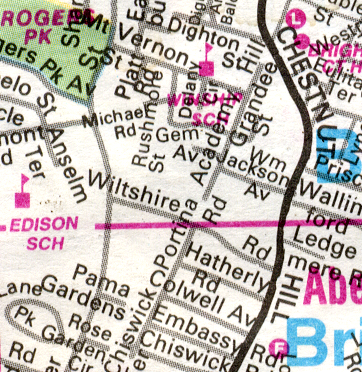 They note that land has "buffered the Brighton neighborhood from the growth of Boston College." Secretary of State Bill Galvin, a Lake Street resident, expresses neighborhood sentiment about BC's expansion plans: "There is a lot of concern -- use and density." The Globe editorial concludes that Mayor Menino "needs to balance the need for college expansion with the neighbors' concerns." “Speculation that the Archdiocese is moving its central operations from Brighton is premature at this point. We have been studying the long-term needs of the administrative offices of the Archdiocese and are exploring several scenarios,” Archdiocese spokesman Terry Donilon said. Maybe they don't want to anger the Mayor? Here's the original report from the Boston Herald. Here is a flyer with information on the lectures and walking tours. Mayor Menino, State Representatives Honan and Moran, and a host of Allston-Brighton residents gathered to help dedicate a park/garden in honor of long-time activist Theresa Hynes. Rep. Honan called her the "one of the Grand Dames of Activism," who has taken on "more developers than anyone else in the neighborhood." Rep. Moran echoed that feeling by noting that, in the crowd, you could see many of the neighborhood's activists. "I'm sure I'm not the only elected official to sit down... with Theresa Hynes to ask her advice," said Moran. Added Mayor Menino, in a good-natured ribbing: "We've all had our issues with Theresa Hynes." The park is a lovely and secluded spot, tucked away with an entrance off of William Jackson Avenue, Brighton. Yes, it even has bicycle parking spaces inside the entrance. The Boston Globe ran a front-page, above-the-fold, article in today's paper that the Archdiocese of Boston are in the "final stages of negotiating a deal to move their offices from the campus in Brighton... to a four-story building off route 128 in Braintree..."
Many of us heard unconfirmed reports on Monday that Archdiocese employees at the Chancery are currently packing up their office items, with a move completion targeted before September. The question is: where are they moving the offices? "St. John's Seminary will remain at its current location, regardless of the outcome of our assessment of the long-term needs of central administration," said [archdiocesan spokesman Terrence C.] Donilon. The Globe story implies that the Archdiocese may no longer be considering moving their administrative offices to St. John's Hall. While the Archdiocese has stated clearly that the seminarians are intended to stay in St. John's Hall, it is unclear whether or not the Archdiocese would sell the building and under what circumstances the seminarians would stay. The reported sales price for the remaining property is $20 million for the 4.75 acre of the Chancery site, and $40 million for the 13.5 acre of the St. John's Seminary buildings site (and adjoining woods). I am guessing that the library is part of the latter parcel. Since the Archdiocese and Boston College already have a purchase and sale contract which includes a sell option for these properties and a price, then why would they be in final negotations? My speculation is that they are negotiating sale of part of a parcel specified in the contract, and hence they would have to agree upon the size of the sub-parcel and its price. The likely parcel: selling Bishop Peterson Hall but not St. John's Hall. We'll see. Note that Boston College's master plans have included buildings sited on the Chancery land not yet sold to them; there is little surprise at this point that it will be sold to BC. The surprise would be if the Archdiocese offices altogether move out of Brighton. The Boston Herald first broke news of the story last Saturday. A final note: The Globe's story includes a graphic of the Brighton property already sold, and that which may be sold in the immediate future. The graphic contains two subtle factual errors as to the seller of 196 Foster St (which was actually Virginia Dalton, not the Archdiocese), and the purchase dates of 188 and 196 Foster St (which were both purchased in 2006, not 2004). Story in the Allston Brighton TAB. "The State of the Neighborhood"
Hear from and speak with Allston Brighton's elected representatives on issues facing our community. Meet the City Council candidates! Get information about local agencies, their programs, and services. The Boston Globe reported today that Target is considering four sites in Boston for a new store, including one site in Boston. The four neighborhoods are Downtown Crossing, Brighton, Charlestown, and West Roxbury. The Globe's source was Mayor Menino, but a Target spokesperson would not confirm the reported sites. Where in Brighton would a new Target store go? Comment here with your suggestions. The state budget has allocated $250,000 for design stage of a Nonantum Road re-build. The plan is to reduce the current four lanes of fast, dangerous traffic into a calmer two lanes. The current layout is accident prone at the intersection of Charlesbank Road and Nonantum Road in Newton. As reported by the Newton TAB, State Representatives Peter Koutoujian (D-Waltham), Kay Khan (D-Newton), Ruth Balser (D-Newton), and Rachel Kaprielian (D-Watertown) led the effort to fund last year's study and the upcoming re-design of the roadway. In reading this information, I learned two terms about street design: "road diet" and "complete street". Nice terminology for including pedestrians and bicycles in the design, as well as getting cars to slow down. The Boston Globe's City Weekly section had a story today about loud parties and policing, primarily in the areas of Brighton neighboring Boston College. The Boston Police Department recently started a "party hotline" (617-343-5500) for residents to call instead of 911 when complaining about loud parties. The problem: police response, or lack thereof, appears to be just as bad as before, report several area residents who have used the new phone line. [Members of] the [Radnor] Neighborhood Association repeatedly [have] called Boston police, and notified BC police and the school's community affairs office, but the situation remains unchanged, [Karen] Marshall said. Boston College will be having their annual commencement exercises on Monday, May 21 at 9:30 am at Alumni Stadium. The event lasts two hours, followed by diploma ceremonies at noon at the individual schools. There will be lots of vehicular and pedestrian traffic throughout the campus, but particularly near the intersection of Commonwealth Ave., Lake St., and St. Thomas More Road. Parking will spill out onto the Brighton Campus. Avoid the area for much of the day -- like a football game day. Area residents are invited to attend a community meeting to analyze and discuss the details of the Boston College development plans. The meeting will take place on Monday, May 21st, 7:00 pm, at the Edison Middle School, 60 Glenmont Road, Brighton. The Boston College Neighbors Forum is an unaffiliated, independent grassroots discussion group. The goal of the meeting is to build a consensus in the community on issues of common concern, and to eventually prepare formal community feedback to BC and the City of Boston. The May 21 meeting will focus on BC plans for transportation-related issues, including re-routing St. Thomas More Road and moving the MBTA station. Proposed buildings along Commonwealth Avenue will also be discussed. Friday's Allston-Brighton TAB runs interviews with five of the nine candidates for the Allston-Brighton seat on the Boston City Council. Boston Bulletin Editorial: Allston-Brighton City Council Seat is the "Hottest Race"
The hottest race, however, may be the District Nine seat up for grabs in Allston-Brighton. The decision last week by City Councilor Jerry McDermott not to seek re-election, led to a last minute flurry of interest among those considering a run. Currently collecting qualifying signatures are Timothy Schofield (who ran unsuccessfully for the seat previously held by Brian Golden), Paul Creighton, Benjamin Bloomenthal, Gregory Glennon, James Joseph Jenner, Allessandro Alex Selvig, Brighton Main Streets Director Rosie Hanlon, Mark Alford and Mark Ciommo. That so many candidates are already active is no surprise. But what may be surprising is the potential for a re-alignment on the council. This morning, I ran past the newly-paved section of the Charles River bike path on the Brighton side between the North Beacon Street Bridge and the Arsenal Street Bridge. Approximately 40% of the bike path between those two bridges has just been re-paved (there was a work crew on-site), comprising the worst parts of the path, i.e., those that had very large bumps due to tree roots pushing up the asphalt. Beautiful! My daughter may not appreciate the change: she loves to yell "Bump! ... Bump! ... " both on the bike and in the running stroller. On the Watertown side of the same stretch of the Charles River, however, was an ugly site: the street (Greenough Boulevard) was completely flooded -- about as bad as I had ever seen the flooding there, even though last night's rain was far from heavy. This occurred despite repair work during the last six months or so, which supposedly improved the storm drains on the north side of the Boulevard. Watertown Public Works crews were busy digging a large trench to clear up the mess and hopefully solve it this time, since the previous effort appears to have done more harm than good. As of 5:00 pm today, Greenough Boulevard was still closed to vehicular traffic, although the bike path is open. Are There Another 1000 New Employees Hiding in BC's Master Plan? Are there 1000+ additional, new employees possibly lurking around, un-mentioned, in Boston College's master plan? If so, this would have profound impact on their planning for parking and transportation. Really now, BC claims no additional staff? Huh? For anyone who has ever walked into a life sciences research laboratory on a university campus, they know that the number of support staff (in addition to students) easily dwarfs the few members of the faculty. Those extra people are the post-doctoral researchers, scientific staff, techs, dishwashers, stock room employees, custodial staff, secretaries, grant specialists, etc. Lots of 'em -- especially the post-docs in the life sciences. Maybe some might be full-time contract workers (i.e., not technically BC employees), but their impact is identical on parking, traffic, and the transportation infrastructure. The ratio of total employees to faculty is then (117+59+165+201+43)/43 = 13.6. Yes, that means one faculty member plus 12.6 other employees equals 13.6. Similar numbers exist for research departments in the Harvard Medical School, such as the Department of Molecular and Cell Biology. In BC's numbers, however, the ratio of total employees to faculty is then (100+175+0)/100 = 2.75:1. Compared to Harvard, BC's numbers appear wrong by a factor of five!!! If Harvard's planning numbers are used instead, then we would expect 100 new BC faculty members to result in a total (faculty + non-faculty) of more than 1360 new employees (including graduate students). That is 1085 employees more than BC suggests would be added in the course of their master plan. No small peanuts. And certainly not a case of no significant impact. If 75% of these 1360 new BC employees drive to work, then BC needs to build 1020 new, net parking spaces. But their current master plan only builds 105 new, net parking spaces. They are off by more than 900 parking spaces. Ouch. I could be wrong a bit in a few details in the math since BC has not yet formally filed their master plan. But the numbers so far presented don't pass the smell test. Let's hope they dig deeper and come up with realistic numbers for the increase in employees associated with their master plan. Harvard did, although they basically suppressed the information by burying it within Table 3-3 of their January 11, 2007 IMPNF. If BC doesn't build the parking on-campus, then where will all these extra employees try to park? I think the residents of Brighton already know: on our streets. Ouch again. Where will the extra cars travel to get to work? Through intersections like Lake Street and Commonwealth Avenue, already rated a level F for service. Ouch yet again. 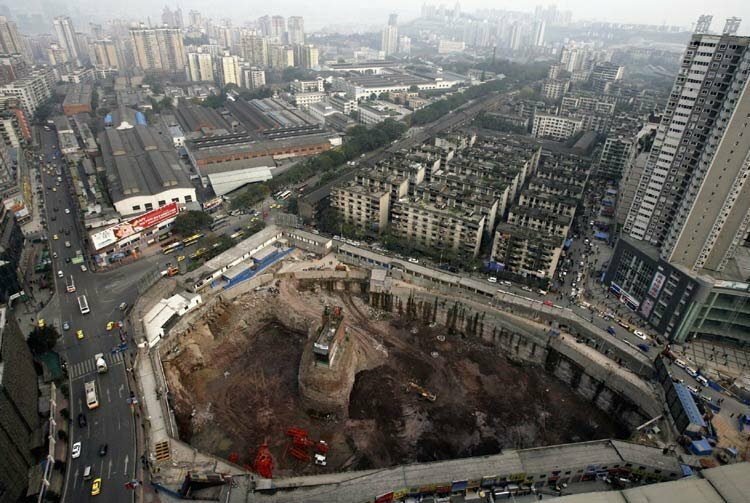 A picture similar to this appeared recently in the Boston Globe (and on Harry Mattison's blog) about a woman in Chongqing, China who is defying the developers there. 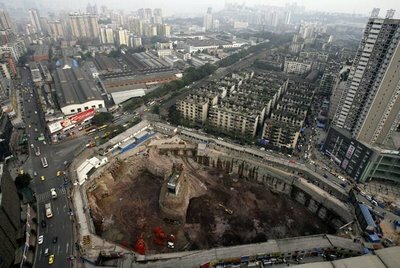 This kind of large-scale redevelopment isn't done anymore... wait, I momentarily forgot about the Big Dig. At the age of 26, James Jenner is the youngest in the field of nine running for the open, Allston-Brighton seat on Boston's City Council. Since age 12, he has been participating in one political organization after another: the campaigns ofJerry McDermott, Patricia White, and Maura Hennigan, and the 2004 Democratic National Convention in Boston. Jenner is approaching the Council race very seriously: he has taken time off from both of his jobs (at Papa Gino's and UPS) in order to run full-time. He calls himself a "regular guy, not a politician. I have the same problems as my neighbors have." He wants to be a City Councilor in order "to be a voice for my neighbors. The true wishes of the people are not always addressed to their content." A lifelong resident of Brighton -- except for one year -- he thinks "there is no place like Allston-Brighton when in comes to culture and diversity... It's a wonderful, wonderful place to live." Jenner sees the major issues confronting the Allston Brighton neighborhood as "collegiate enroachments in our neighborhood," substance abuse, overlooked problems of lighting and crosswalks, a high dropout rate in the educational system, and the high rate of burglary. "Of all the burglaries in the City right now, [so many] of them belong to Allston-Brighton." His solution is two-fold: "working not just to punish those who are caught, but also to improve the preventative measures like neighborhood crime watches." Similarly, he sees that the substance abuse problem in A-B "has to be addressed by the police as well as by a community leader." His future vision for A-B looks back to its past. "I would love to restore Allston-Brighton to its family-rooted and culturally diverse status it once had," he says, "as well as bringing more arts into the community. 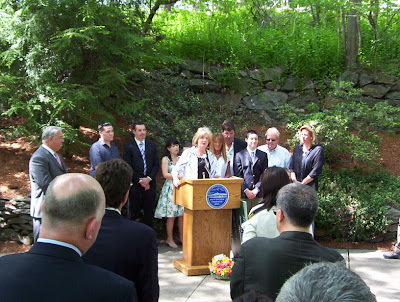 The Brighton-Allston Heritage Museum is a great addition." "It feels like the residential areas of the neighborhood are becoming bordered off," Jenner continues, in reference to the institutional expansion in the neighborhood. "The students bring a lot to our neighborhood, but [we should] incorporate them, not exclude them." He points his criticism on this issue at Boston College. "I didn't really hear anything [in their master plan] about including the neighborhood; it was all about continuity [within] BC's campus. The time is now for them to make a really big gesture." Five of these candidates have run for office before in A-B. Three of the first-time candidates (Alford, Jenner, and Selvig) live close to the St. John's Seminary land bought by Boston College. All candidates have until May 22nd to file a minimum of 139 certified signatures of A-B registered voters in order to make the ballot. Some of the candidates have only taken out papers very recently, but those who were collecting over the week-end have reported collecting between 60 and 400. EDIT (2007 June 5): Creighton and Bloomenthal have failed to submit the necessary number of signatures in order to appear on the ballot, leaving the other seven candidates for the seat. EDIT (2007 July 5): Alford has withdrawn from the race, leaving only six candidates on the ballot. Mark Alford, a resident of Lake Street in Brighton, entered the race yesterday for the open Allston-Brighton seat on Boston's City Council, according to John Donovan of the Boston Elections Department. Donovan also confirms the other names that have been listed on this blog previously, which brings the official list of candidates for the seat to nine. The Boston College newspaper, The Heights, reported that a City of Newton firefighter was seriously injured while working at a dumpster fire on the BC campus last night. The firefighter was injured when the fire truck unexpectedly "lurched forward" and ran over him. The assistant fire chief on the scene tentatively blamed the accident on "this damn equipment we have." The fire was reportedly started by people -- who appear to be BC students -- who were burning books and papers in the dumpster. Today, May 15th, is the last day of the year-end examinations according to the BC academic calendar. No word on disciplinary action yet on students who may have been involved in starting the fire. Paul Creighton is no stranger to Allston-Brighton politics: he had a strong showing with more than 30% of the vote against then-incumbent Councilor Jerry McDermott in the 2005 race. He works as the Director of the Allston-Brighton Area Planning Action Council. Creighton wants to be City Councilor because "being an elected public official is an honorable position to have. I think I can be helpful to the neighborhood." "The community and neighborhood infrastructure has disintegrated, and there are very few institutions left that would make for a strong community life. The number of people starting families has shrunk tremendously... The schools are less and less meaningful in people's lives. The expansion of the larger institutions (particularly BC and Harvard) are almost a death blow to what I view as a neighborhood life... The degree of change has only accelerated over the last few years." His list of major issues confronting the Allston-Brighton neighborhood is broad: increasing property taxes; a tight city budget; unaffordable housing; little confidence in the school system; and traffic. He blames many of the problems on the ever-expanding institutions, and the "willy-nilly" way that all the change is occurring. "It's going to be one big dormitory, one big academic institution," he says. "It will be very hard for anybody else to lead a different kind of life that doesn't march to the academic beat." Looking forward, Creighton maintains that "unless you do something to try to change the culture of city services, it's all going to get worse." A long-time community activist who started his career in the war on poverty, Creighton still believes "that community action and organization [are] a way to contend with these powerful forces. You begin by organizing people to fight the fight." Finally, he sees the role of the City Councilor as someone who "has to be out front, not sort of sitting on the sidelines waiting for how the wind blows. The district City Councilors are supposed to be leading... You have to be someone who is prepared to fight City Hall." "Lifelong Allston/Brighton resident & political activist James Jenner has taken out nomination papers for A/B District 9 City Council." He has previously worked on the campaigns of Jerry McDermott, Patricia White, and Maura Hennigan. This brings the number of confirmed candidates up to eight. I bet we hit double digits before the deadline at the end of Tuesday. Mark Ciommo ran in 2002 for the Allston-Brighton seat on the Boston City Council, losing in the run-off to current Councilor Jerry McDermott. He has been out of town for a few days, and has just decided to enter the race for the newly open seat. He will be pulling papers later today. Ciommo's candidacy brings the number of confirmed entrants to seven, with two more probable candidates in the wings and another one or two possible ones. Stay tuned for more details. Find out all about novelist Hannah Foster, educator Harriet Baldwin, Veronica Smith, heiress Mary Ann aneuil Bethune, "postmistress" Sarah Worcester, and other historical women's figures in our neighborhood. This is a presentation and discussion to launch of the Women's Heritage Trail. Rosie Hanlon is well-known in Allston-Brighton as the Executive Director of Brighton Main Streets, although she is also involved in many other community activities. I caught up with her the day after she formally picked up papers at City Hall to initiate her candidacy. "I'm a city girl," says the lifelong resident of Brighton. "I love the convenience of my area. I love going down to the river and up to the reservoir." She has run unsuccessfully twice before for the Allston-Brighton seat on the Boston City Council. The first was against City Councilor Brian Honan in 1997. "I was really concerned with the apathy" in the district, she said. "If we don't vote, then we don't get the city services that we need. My mission was to get people to vote." Following Honan's death, she was among nine candidates for the seat in 2002 during her second run. She considers there to be three major issues currently confronting Allston-Brighton: institutional expansion, public schools, and substance abuse. Rosie has been a member of the Boston College Task Force for many years, and remembers the process they went through over the last master plan. "We were adamant" that BC would have to put more undergraduate students on campus, she said. "By the time the master plan was developed to completion, we got it up to 800-plus beds." Regarding today's institutional expansion plans of Harvard and BC, she notes: "Development is going to happen, but it has to happen in a reasonable way that doesn't impact the peace and quiet of our communities." But she also cautions against blaming institutional expansion for the high rates at which families are moving out of A-B. "We lose families because of the school system. I think our school system is getting better, but we still have a 40% dropout rate." She also notes that too many families pull their children out of the public schools after kindergarten. "We really have to make sure that our public schools are community public schools." She is passionate that the community needs to better recognize the problem of substance abuse among the neighborhood youth. "You can right now buy a bag of heroin for less than the price of a happy meal." Drug transactions, she says, are widespread in "the parks, the parking lots, [and] the convenience stores" in A-B. Part of the solution is "to prepare the parents, and let them know they have the support they need." Looking toward the future, Rosie has a vision for the neighborhood. "Brighton has always been like the peninsula to the City of Boston. I have been working towards Brighton being known as a 'destination'... a place that people will want to be." Through the grapevine, many people have been told by Rosie Hanlon that she is running for the open, Allston-Brighton seat on the Boston City Council. The first campaign sticker of hers was seen this afternoon being placed outside the former Seoul Kitchen restaurant in Brighton Center, so there is now no doubt that she is in the race. We'll see how fast the other candidates print up stickers -- and if they can manage to get any up on storefronts in Hanlon's Brighton Main Streets territory. Interview With Council Candidate Tim Schofield: "Now is the time to fight this fight"
Brighton resident Tim Schofield has announced his candidacy for the open Allston-Brighton seat on the Boston City Council. I caught up with him after the "human flag" event that was part of the Brighton-Allston Bicentennial celebration. He grew up in a more rural environment in southern New Hampshire, and spent several years in the military during the Gulf War, but was attracted to Allston-Brighton because he "was looking for a balance of urban and community: Allston-Brighton had the reputation of being that kind of place." He added that A-B is "a community [where] you can live in an urban environment yet still have a small-town feel." He wants to be a City Councilor because he thinks he "can make a difference in making this neighborhood a great place to live." The major issues confronting the A-B neighborhood are "the foundational, or quality-of-life, issues: affordable housing, so people can stay here; good public schools; and public safety, where we have a different kind of battle [compared to other Boston neighborhoods], like density issues, students, and the 'broken windows' effect." He has sat on the BRA's Boston College Task Force since March 2007, giving him a first-hand experience on the relationship between institution and community: "Institutional expansion goes hand-in-hand with these issues. [It is] the most important, specific issue facing the community right now." He concluded, "The next few years are going to define the next 100 years for our community. Now is the time to fight this fight." Watch this blog for more information on the fast-changing events surrounding the race for the open City Council seat. Word on the street is that there are at least three or four more people entering the race -- on top of the five candidates who have declared to date. But there are also a few people who stated no plan to run. I'm working on getting short interviews with all the candidates as they declare, and will post those interviews here; also see the previous interview with Alex Selvig. Location: steps of Brighton High School, 25 Warren Street, Brighton. 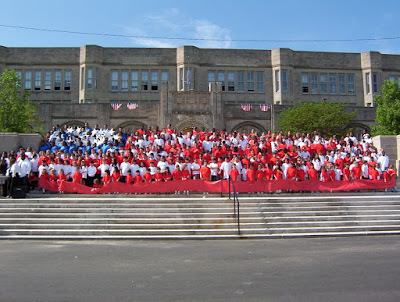 School children from all over the neighborhood gathered on May 11, 2007 to celebrate the bicentennial year of Brighton's founding (after seceding from Cambridge). This "human flag" recreates a similar event at the centennial celebration in 1907. The Boston Bulletin ran an extended interview yesterday with outgoing Allston-Brighton City Councilor Jerry McDermott. "For the past five years, it has been get up, shower, shave, go to City Hall, get out, go to meetings and, by the time I get home, everyone is already in bed," he said. Anybody still want to run? "God knows, I’ve fought the battles. I’m not going to say I’m punch drunk, but I am a man who feels his adrenalin... I took my punches, but I’m leaving on a high note." Human Flag Recreation: This Morning at 8:30! Part of the Brighton-Allston Bicentennial celebration. Re-creation of the Centennial Living Flag at Brighton High School, 8:30-10 a.m. This event will re-create the “Living Flag” which was the cornerstone of the Centennial Celebration in 1907. More than 400 children from local schools dressed in red, white and blue and holding colored bunting will be arranged to form a living American flag. Location is the steps of Brighton High School. An ice cream party will follow. Brighton High School, 25 Warren Street, Brighton. A-B TAB: "Get ready for a race"
We’re looking forward to some healthy debate about the issues that matter most to A-B and we’re confident, with this much interest in the position, that A-B will likely find another passionate advocate in City Council. From the Allston-Brighton TAB: Gregory Glennon and Benjamin Bloomenthal have announced for the Allston-Brighton seat on the Boston City Council. Also watch their homepage for election central. 11:40 am today there was a modest-sized fire burning in the "wetland" grasses along the banks of the Charles River immediately northeast of the Arsenal Street Bridge. Fire and police crews were on the site setting up equipment, which required extremely long fire hoses to bring water into the site from Greenough Blvd west of Arsenal St.
For the immediate future, avoid Greenough Blvd/Memorial Dr between N. Beacon St Bridge and Eliot Bridge, and the Arsenal St Bridge altogether. Alex Selvig of Lake Street, Brighton, has just announced his candidacy for the Allston-Brighton open seat on the Boston City Council; the candidate agreed to a short interview. He runs a business importing boats for crew use, and has previously coached for the Community Rowing, Incorporated. He has never run for political office before, so he considers himself a longshot. "I'm psyched to bring a whole lot of issues to the forefront." He expressed the desire for his candidacy to be a grassroots-based one. When asked how he would fare in a race that might cost $25,000-50,000, he said, "I may have to run with whatever I can raise. I'll keep driving until the gas runs out." "I think that Brighton is slowly being choked off," he continued. "It is a neighborhood of Boston that is being sacrificed... where university expansion is more valuable than keeping a part of town for families and people to live in. I just want to make this a better place to live." He also listed improvement of public schools as an important issue facing the neighborhood. Via Harry Mattison and BostonNOW: Paul Creighton has jumped into the race for Allston-Brighton's open seat on the Boston City Council. He is director of the Allston-Brighton Area Planning Action Council, and ran strongly against Jerry McDermott in 2005. Also reported: Rosie Hanlon of Brighton Main Streets is strongly considering joining the race, too. According to the mayor's spokesperson Jennifer Mehigan, candidates for Jerry McDermott's seat must file papers by May 15. By May 22, they must submit 139 legible signatures from registered voters in the district who have not signed for another candidate. I personally called the Elections Department on Wednesday morning, and was told that the requirement was 200 signatures for the A-B councilor's race. (The number of signatures apparently varies by district.) Somebody in City Hall: please get your story straight! This part of Wiltshire Road -- which I'll informally call "Wiltshire Path" -- has limited use for pedestrians, particularly students heading to or from Edison Middle School. There were large barriers on either end, and the path itself could become quite overgrown in the late summer / early fall. In short, no cars could get through -- exactly what the neighbors wanted, because it has the potential of being a major cut-through street, and hence could bring a lot of traffic next to a neighborhood full of (large) families. At some point last fall, the barriers were removed altogether. What's more, the grass and shrubs along the "Wiltshire Path" were cleared. The occasional car was seen driving through. Neighbors were both angry and concerned that the traffic would make it dangerous for their children. I can attest that there are many children outside playing in Portina Road on a warm spring afternoon, since it is such a quiet, secluded street. The big question: Who removed the barriers and cleared the brush? 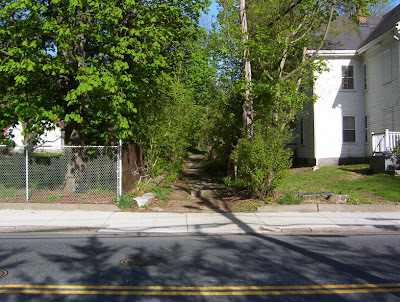 The "Wiltshire Path" stretch of Wiltshire Road is a permanent City of Boston easement (for a public way) on the 188/192 Foster Street parcels previously owned by the Archdiocese of Boston but sold in 2004 to Boston College. The path abuts another large parcel still owned by the Discalced Carmelite Friars, a non-diocesan order. Oddly, there appear to be pieces of asphalt partially exposed under the dirt, grass, and shrubs, as if it had all been pave at one time. Visual inspection of the northeast corner of the 192 Foster Street property showed that substantial tree-work had been done recently in the thick woods bordering the path. The tree-work included large branch removal, and possibly a few trees, likely done by chainsaw. 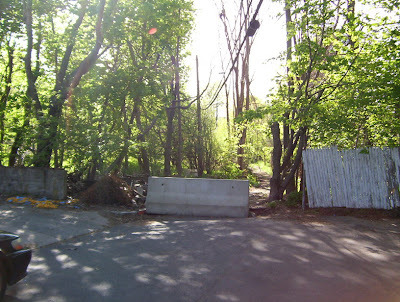 Since the barrier removal and brush clearing are far beyond what a couple neighborhood kids could do, there are really only two possibilities: City of Boston or Boston College. Whomever did it had some serious equipment, time, and a strong desire to see the path cleared and/or maintained. The City has claimed that they didn't do it, and are as perplexed as the neighbors. A Boston College official, Jeanne Levesque, was heard on the April 21, 2007 walking tour -- and later confirmed -- that they didn't do it, either, or know who did. The lingering question is: Why did they (whoever it was) remove the barriers and clear the brush? I'll let the conspiracy theorists have a field day on that one. 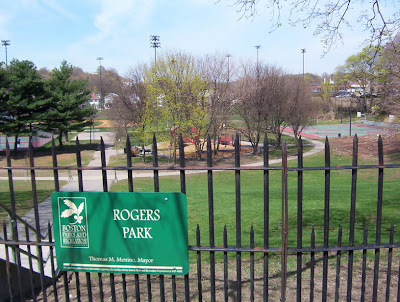 Friends of Rogers Park Meeting 5/10 at 6:00 pm: "Meet the New Captain"
that the Boston Police have exclusive jurisdiction over it. permitted, and what are those users' responsibilities. That sure was quick. One candidate has already jumped into the race for the Allston-Brighton seat on Boston's City Council, according to baywindows.com: Tim Schofield. Since initial papers must be filed within one week, there's not really time for candidates to have big, staged events where they declare their candidacy. More than likely it will be by word-of-mouth, cell phone, email, or post-it note. Anybody heard word that another candidate is running for the seat? Email me at: pahre@comcast.net . The announcement throws local politics into a tizzy, because candidates must initiate their nomination papers with the Election Department by May 15, and complete their filing by May 22. The last election required 98 signatures to file, but a call into the department today stated that 200 would be needed this time for the Allston-Brighton seat. The impressive showing by unabashed liberal Tim Schofield should ensure that Moran keeps his promises on reproductive rights, gay marriage, public education, and other issues that arose during the campaign. That’s clearly where the district’s votes are. Creighton managed to get 30.87% of the vote in 2005, while Kontoff was in the "low single digits" in the preliminary. Again. Note: one candidate has already declared. The day is fast arriving when St. Elizabeth's Medical Center will chop down more than a dozen trees on their property to make way for a (temporary) access road. There have been orange stakes with red flags the last few weeks scattered throughout both the site of the new emergency room and the new access road. The access road land has been classified under Article 51 of the zoning code as a Conservation Protection Subdistrict overlay (as well as another overlay of the institutional master plan area); obviously, conservation holds little sway when the institution rammed this road through the Article 80 institutional master plan process. I hope we can someday bring back the Brown Bar-ba-loots, Swomee Swans, and Humming-Fish. Also planned for the land are a 14,000-square-foot sports support facility and a 200-space garage, according to Jack Dunn, Boston College director of public affairs. Dunn said the 2,000- seat baseball stadium, which is 1,500 seats larger than the current field near Chestnut Hill Reservoir, will still be one of the smallest baseball stadiums in the Atlantic Coast Conference, which BC joined two years ago. Yay! New accuracy in describing the stadium as "one of the smallest" in the ACC, rather than the smallest. 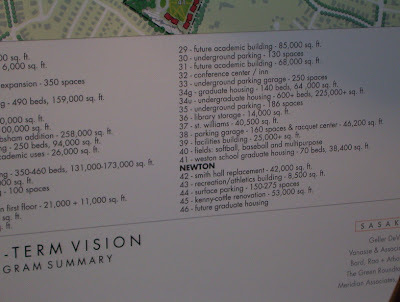 The square footage of the sports support facilities is a little bit misleading, in that it includes the "support facility" building and the parking spaces in the parking garage, but does not include the additional square footage of the enclosed tennis courts on the top floor of the parking garage. Now... about that 14,000-square-foot support facility: Why does their master plan's visual describe the facility as "25,000+ sq. ft."? (See #39 in image below.) This "14,000 sq.ft." 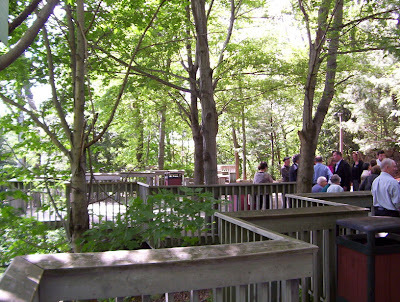 statement was also made by a different BC official during the April 21, 2007 walking tour. Possibly they have decided to downsize the facility since their presentation in mid-March 2007... or they are mixed up on the details of their own master plan. I think BC needs to straighten this one out. Realtor Todd Glaskin of Coldwell Banker said he wasn't trying to "oversell" the property and is telling prospective buyers to do their homework. "If you could blink your eyes and fast forward two years, you know something amazing will be there," he said. Came home last night to find that the power had been out earlier in the day. 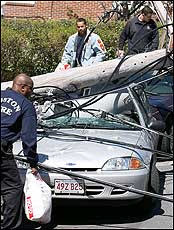 Normally not such a big deal... except when a truck, utility pole, smashed car, and several live wires are involved. Fortunately, students from Shaloh House (stone's throw away) and Winship School (outfielder's throw away) weren't yet out of school. Police made two arrests at Edison Middle School in Brighton while following up on reports that a student had been seen brandishing a firearm on the way home from school two days earlier. This incident follows violence earlier in the year at neighborhood schools Brighton High and Jackson Mann. The Horace Mann School for the Deaf and Hard of Hearing just received a donation of technology equipment from various companies in town for the AIIM ON DEMAND Conference & Expo. The school is located within the Jackson-Mann Community Center facility in Union Square, Allston. Harvard Magazine recently ran an article giving some food-for-thought in dealing with institutional expansion and the City of Boston's failure to deliver on promises to protect open spaces. Boston College has proposed athletic fields covered with astro-turf for the Brighton Campus. In particular, astro-turf would be used for the field for the baseball stadium (including its multi-purpose field in the outfield), the field for the softball stadium, and possibly also the multi-purpose field at the corner of Lake Street and Glenmont Road. I believe that there are very worrisome environmental concerns related to leaching of carcinogenic chemicals from artificial turf into the water table in locations that are susceptible to flooding. The rubber within that layer contains Polycyclic Aromatic Hydrocarbons (PAHs), that are a large class of more than 100 different organic molecules also found in car soot, cigarette and wood smoke, burnt food on the barbecue, and otherwise incompletely burnt fossil fuels. Humans can be exposed to PAHs through inhalation, drink, food, or via the skin. Of 17 PAH molecules that have been studied to some extent to date, seven of them have been classified by the U.S. Environmental Protection Agency (EPA) as probably carcinogenic to humans. Yes, that means "probably causes cancer to humans." Those molecules studied to date are considered to "exhibit harmful effects that are representative of the PAHs." Various human health impacts due to exposure are not limited to cancer, but also include reproductive and hematological issues. Even "advanced technology" rubberized surfaces still contain PAHs (albeit a reduced amount) which can leach into the ground water. The presence of PAHs in astro-turf -- and their propensity to crumble and/or leach into the ground-water -- appears to be generally-known both by buyers and sellers of such products. Sweden has banned the use of rubber tires in synthetic turfs. The cities of Wayland and Newton, MA, have both begun investigations into the public health impact of synthetic turf, and the Massachusetts Department of Environmental Protection may be currently looking into the matter. Here is a long story about problems related to a resident's decision to use astro-turf in his yard in Florida. But lots of stadiums across the country have astro-turf, you might say, and they don't seem to be causing any problems! In the presence of adequate drainage, PAH-contaminated water flows into the stormwater drains, and then down the pipes to a wastewater treatment facility. Now that would be a bad impact on the environment. Astro-turf is simply not needed on this site. Boston College: please do not install it in the flood-prone Brighton Campus. It's just not needed. Strive for Fenway Park or Safeco Field, not the Astrodome. Update: Who Is On Those Task Forces, Anyway? although I am unsure if any have recently left the group. "The BRA: Construction, Reconstruction, Destruction?" The topic is the planning process of the Boston Redevelopment Authority: how the process works, and how residents can have an impact. 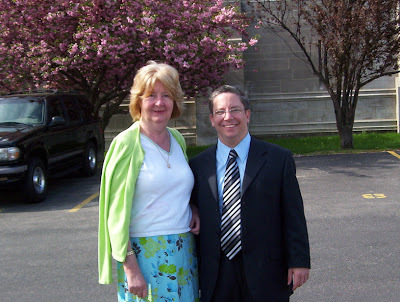 The speaker will be Larry Koff (Larry Koff & Associates, a planning consultant firm). Contact Louise Bonar for more information at 617-254-1729. At Monday's public meeting of the BC Neighbors Forum, the lighting for BC's proposed baseball stadium was discussed. The lights will presumably be the 80-foot field lighting standard (ref 1, 2), but it's hard to get a feeling of what that height would entail at the site. Lane Park houses can be seen on the left-hand-side of the image. The field lights will extend above the tall, old-growth trees (on the left) which lie between the proposed stadium and the abutting houses at Lane Park. The lights appear high enough that they will shine over those trees to illuminate more houses on Lane Park than just the direct abutters. 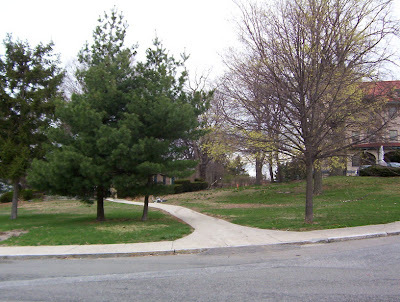 The photo of the proposed baseball stadium site was taken during the April 21, 2007 walking tour of the Brighton Campus (former Seminary property), hence the lack of tree foliage directly shows how the trees themselves will not block the field lights from the direct abutters during the standard April -- early May baseball season. As a side note: the proposed baseball stadium will presumably be 40-50 feet high, which would extend to the top of the neighboring houses (or slightly above), based on a roughly 15-foot difference in grade between the field and Lane Park.